Spontaneous recovery from spinal cord injury is almost unheard of in humans and other mammals, but many vertebrates fare better. The eel-like lamprey, for instance, can fully regenerate its spinal cord even after it's been severed: Within 3 months the lamprey is swimming, burrowing, and flipping around again, as if nothing had happened. In a new study, Marine Biological Laboratory (MBL) scientists report that lampreys recover and regenerate just as impressively after a second complete spinal cord injury at the same location. The study opens up a new path for identifying pro-regenerative molecules and potential therapeutic targets for human spinal cord injury. 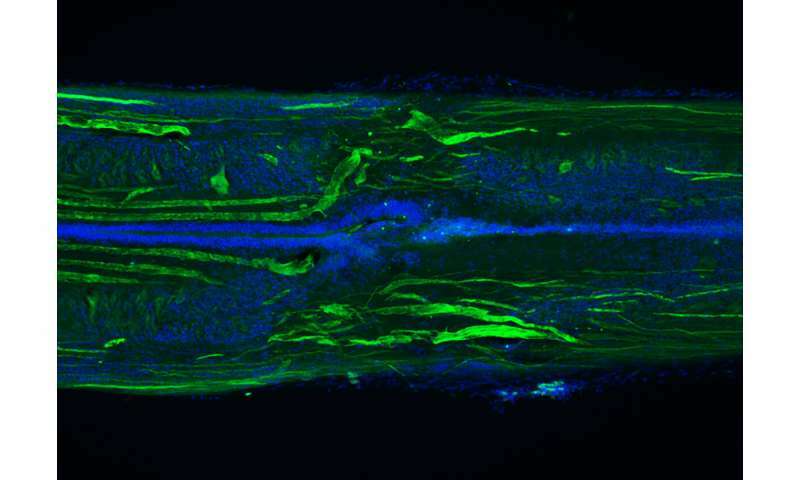 "We've determined that central nervous system (CNS) regeneration in lampreys is resilient and robust after multiple injuries. The regeneration is nearly identical to the first time, both anatomically and functionally," said senior author Jennifer Morgan, Director of the MBL's Eugene Bell Center for Regenerative Biology and Tissue Engineering. Morgan's lab has been focusing on the descending neurons, which originate in the brain and send motor signals down to the spinal cord. Some of these descending neurons regenerate after CNS injury in lamprey, while others die. "We are beginning to isolate individual descending neurons and look at their transcriptional profiles (gene activity) to see if we can determine what makes some of them better at regenerating than others," Morgan said. "The 'good' regenerators, for example, may express molecules that are known to promote growth during development. That's one hypothesis," she said. Observing how the descending neurons respond to a second CNS injury can help the team tease out the factors required for repeated, resilient regeneration, which could have implications for designing better strategies for treatments aimed at promoting CNS re-growth after injury or disease. This study was conducted by first author Kendra L. Hanslik and other former research assistants in Morgan's lab. "These are all young scientists, many who have since gone on to graduate school," Morgan said. "This paper was their labor of love. To go through two rounds of regeneration in the lamprey—that's nearly 6 months of waiting before they could collect the [spinal cord] tissue and begin the analysis. I'm really proud of their heroic efforts in pulling off this work."